The latest in food fads has arrived in time for spring: The Sushi Donut hot on the heels of the Cronut! Come and get it the Sunday at the W5 Food Market. I do, however, have to work to get the cronuts: there are a lot of logistics involved in their procurement from the Rinkoff Bakery of Commercial Road or the Elizabeth Street location of luscious New Yorker Dominique Ansel in order to get them back to my family – panting in anticipation - in time for afternoon tea. I am actually grateful that they have the decency to be halfway across London making the effort herculean but well worth it but the constraints of time – and our waistlines – reduce my pilgrimages to once a month. On the other hand, the sushi donut is the antidote to its triple bypass cronut. Completely devoid of sugar suspended in gluten and butter, then deep fried, instead it has all the well known and acknowledged benefits of sushi. This tasty, guiltfree sushi snack is all over social media like a rash and keeping the younger audience interested. A balanced and cheeky concoction of sushi rice with raw fish, crisp vegetables, seeds and cress toppings. Very photogenic - hence its recent Insta-fame - and the perfect snack size not dissimilar to an onigiri, temaki or half a sushi burrito. Try out my virtous sushi donut this coming Sunday at W5 Foo Market in Ealing . And who knows, it just may pop up on the menu at one of our Brøkton (link here) kitchen take overs at Vinidinista the first Tuesday of the month. For my first ever blog I wanted to talk about herring, the fish which connect my past with the present and should project me in to the future too. The tree is gone and the decorations are all packed away but I cannot and will not banish the traditional Danish Christmas herring! I am making more than a resolution; I am making a manifesto: all hail the magnificent Atlantic Herring! Herring belongs to the pelagic family of fish which includes other all-important oily fish like sardines, anchovies and capelin; it also shares their fashion sense: sporting a light silver coat belly side to merge with clear skies when seen from below and a darker, metallic blue topside to blend with the surf when hunted from above. Herring is a forage fish and therefore part of the food chain that converts plankton and other tiny sea creatures into supercharged protein and is integral to the bio-diversity of many seas. Herring feed upon phytoplankton when young and zooplankton like copepods and small grill in adult life. Swimming in shoals at 6 km/hour, full grown herring are approximately 30 cm long and bursting with Omega 3 (DHA, EPA & high levels of Vitamin D) making them particularly rich eating during the dark, Nordic winter months. Herring is also an important food fish for bigger pelagic fish like tuna and salmon as well as sea mammals and birds. Like other pelagic fish, herring are relatively easy to fish: they swim in solo-species shoals close to the surface and so can be caught using drift nets or mid-water trawl (a funnel shaped net hauled by one or two boats) that don’t damage the seabed nor catch unwanted species. However, the clever little herring tends to swim lower during the day and come to the surface to feed only under the cover of night darkness. Herrings are highly reproductive and also a migratory fish so spawning occurs at different times through the year among different tribes, but primarily during spring time. Females can spray (lay) between 20,000 and 40,000 eggs, depending on sexual maturity; the eggs then sink to the seabed where they attach in clusters to algae, seaweed and rocks. The eggs develop only in the right conditions but this is a slightly more reliable system than the free floating fish eggs of other species. Like juvenile salmon, herring larvae hatch with a small yolk sac nurturing them until they grow to 10mm in size – they are virtually invisible with transparent bodies with pigmented eyes at 3 months of age. Over the first year of life, herrings develop shape and grow fins but it takes a full 3 years to reach reproductive maturity. The UK’s only certified herring fishery is the MSC Hastings whose season starts in late October and runs through January. Atlantic Herring has recovered in the Northern Hemisphere since its collapse in the 1970’s but that is not to say that there is an endless supply. The Marine Steward Council has been very successful with herring so as long as you eat MSC herring, you are assured that the herring has been fished or farmed sustainably. Herring was traditionally fished from late June, the season usually starting after St. Johns in the religious calendar but perhaps this had more to do with fishing calmer seas and being able to process the fish during the longer days. These days, demand still spikes during Easter and Christmas but herring is fished year round. Herring has been fished in the North Atlantic for over 1,000 years; and pickled herring has become a celebrated delicacy, central to cultural rituals and traditions for generations. Once the Vikings figured out how to get beyond the coastal waters, they chased the herring shoals all the way to the UK. Herring fisheries were immensely important to the growth of European capitalism as a key source of protein across the Scandinavian and mid-European nations. Large scale herring fishing and curing most probably originated in Scania, the southern tip of Sweden, then a province of Denmark, circa mid-Thirteenth Century. The trade spread throughout the Baltic nations with Lubeck- now Northern Germany – emerging as a key center. Herring as a commodity helped empower the Hansa Guilds being an important building block for European politics and commerce today. Was Omega 3 rich herring responsible for the rise in education and academia? Was the Renaissance fueled by herring? Inevitably, trade wars broke out between the Hanseatic League and the Danes and then the Dutch. The Dutch went as far afield as the northern tip of the UK; they fished the coast of Scotland and thereby supported many local communities, especially the Shetlands which was a major outpost for the herring fleets and for herring processing. The herring season meant big business as well as long hours of back breaking work - done almost exclusively by women. The ‘herring girls’ were on point for when the boats came ashore, poised to cut, bleed and pack the oily fish in barrels of salty brine to be shipped to North Germany and the Netherlands. The women typically worked three to a barrel, two cutting and gutting while a third packed the herring into the wooden barrel alternating with layers of salt and ice at the dizzying rate of 60 herring a minute. It was cold, wet, repetitive work in horrendous conditions with little to no sanitation in the cramped accommodations. However, the work was well-paid compared to fulltime labor and as it was seasonal, it fit in well with harvest work. More than that, it was probably rather exciting: the work took them away from the strictures of home and came with a certain amount of economic freedom and the hard work was broken up by Saturday night dances and Sunday morning sermons. Herring processing thrived in Scotland from the late Nineteenth Century through the 1930’s – powering the Industrial Revolution - and industrial action helped improve conditions. But tastes changed, refrigeration arrived and the fishing fleet was requisitioned for the Second World War effort but when the herring didn’t appear on the Scottish coastline in 1939, it spelled the end of Scottish herring fishing. The disappearance was likely a combination of oceanic conditions and overfishing. We no longer need to preserve herring in salt (spegesild in Danish) but this method of preserving herring has become a cherished tradition passed on from generation to generation. What is more difficult is garnering enthusiasm for the delicious, healthy fish while it is fresh and in season. MSC Hastings is the only certified herring fishery in the UK; and while the Southeast is awash in herring and they even hold an annual festival, they cannot shift more than three boatloads a week of the gorgeous silver darlings in the UK despite it being the second biggest fish certified globally. This is shameful when we claim to want to eat fresh, local, sustainable food in season! Herring is all that and pure protein packed with Omega 3! As a Dane, I hold herring close to my heart and if I ever feel homesick, pickled herring is the cure. However, I have also worked as a sushi chef for 20 years and in all that time I have struggled to find a way to prepare herring suitable for sushi. Pickled herring is far too strong a flavor for use in Japanese cuisine and the intense vinegar clashes with the delicately pickled sushi rice; pickle with pickle simply does not work. I have also held a long running conversation with some of my favourite London fish merchants about how to reinvent herring from the standard, preserved, sour roll mops to a flexible, healthy, fresh sea food fish. I decided to start from scratch and in October 2014, along with Alex Renton of The Guardian, Hannah Thomson of www.cater.com, and a team from MSC, I went in search of the holy grail of Danish herring: Christians Ø, named after the fortress of King Christian V off the tiny Danish island Bornholm where the recipe for the herring I grew up with was originated 665 years ago. On Bornholm, the herring is left in a thick, salty brine for about 3 weeks to ‘mature’ the protein before it’s transferred to various cures. Curing the herring has an additional benefit: herring are bony and even after filleting, there remains a row of tiny stubborn bones that require patient pin boning, but these bones seem to dissolve, or at least soften, during the curing process. I needed to deconstruct Danish herring and to do that I had to see the process in person as the Bornholm recipes are well guarded trade secrets. There are two main versions: Ruth’s Sild and ChristianØpigen’s Sild. Local islander Ruth Hansen developed her recipes based on island tradition when herring was still fished in the Baltic Sea. This herring is matured and pickled in exactly the same way as it has for the last 100 years and has now become the main source of income for the island’s 100 inhabitants as most visitors (40,000 in the summer) will leave with a bucket of Ruth’s Sild. The tradition is carried on by Ruth’s daughter Rikke who returned from the main island to continue in her mothers’ footsteps. Rich folklore surrounds this herring; one of the stories is that the five spice version of Ruth’s Sild came about after a trade ship, packed with spices from India, capsized off the island’s coast. Kim Rømmer’s ChristianØpigen’s Sild is a slightly larger operation and in fact uses a slightly larger herring (now mainly fished in the North Sea and Østersøen). Kim is deeply proud of his 10 varieties of cured herring. He is convinced (so convinced that he paid 100K for the recipes!) that herring will take pride of place on your plate once again and is happy to come to a town near you to convert you. You can find his herring in 2 major Danish supermarkets and if you can, I recommend picking up a pot or two. After my inspiring trip to Bornholm, I was determined to create herring dishes with a distinct Japanese twist. I started with the MSC herring from Hastings as it is plentiful and sustainable. Their season usually starts around October but due to the suspiciously mild autumn and December it started much later this year. Here are 3 tried and tested recipes using a light cure herring instead of the traditional pickled affair. The same procedure can be used for mackerel but I like to give the herring a full hour in the salt cure before rinsing and curing (link to mackerel tutorial). Here is the latest fusion cuisine: Nordic Japanese! 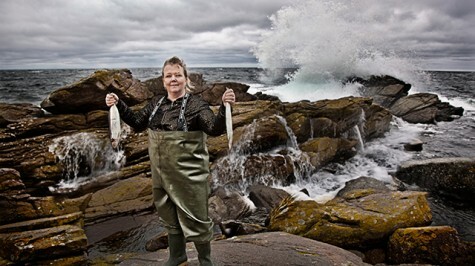 For the full articles and pictures, please read Alex Renton (http://www.theguardian.com/lifeandstyle/2014/nov/12/herring-sustainable-fisheries-danish-uk-sushi-restaurants) and Hannah Thomson (https://www.thecaterer.com/articles/354626/raw-talent-silla-bjerrum-investigates-danish-herring) great articles about our voyage of herring discovery.